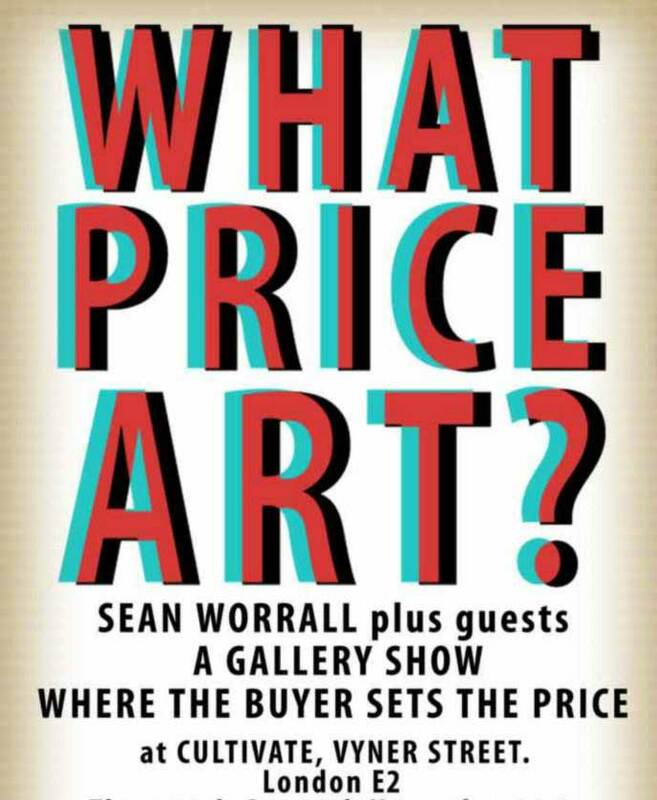 SEAN WORRALL & Guests – WHAT PRICE ART? 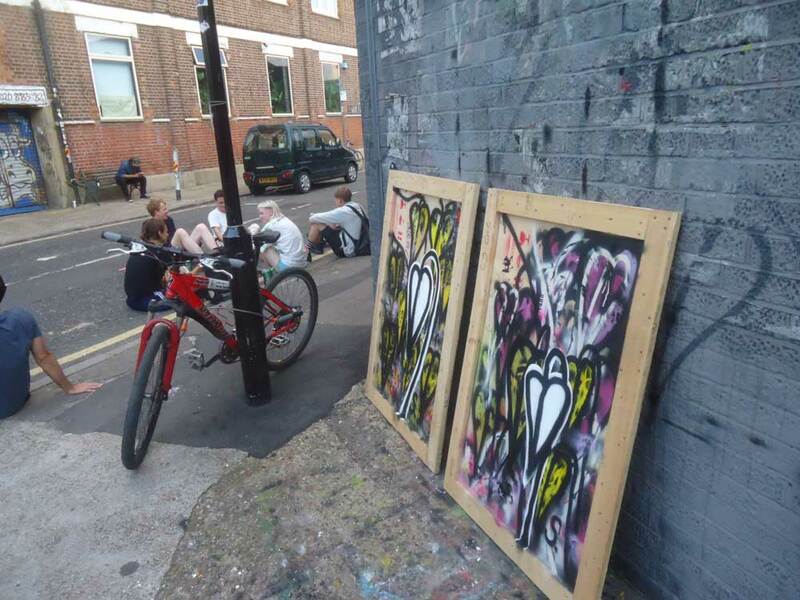 An art event at Cultivate, Vyner Street, London, E2. What price art? An event where you name the price and there is no debate….. An original piece of art for the price of a pint or a cake or a house or a horse or…. What price art? 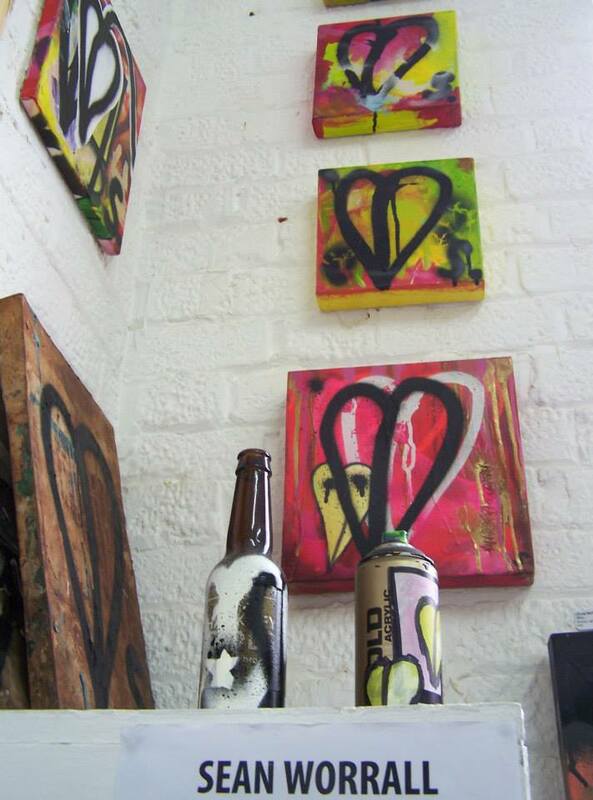 From Thursday 18th September until Sunday 21st September one half of the ever evolving art space called Cultivate will be devoted to another What Price Art event. The event starts at 11.30am and the gallery is open 11.30am until 6pm from Thursday until Sunday. 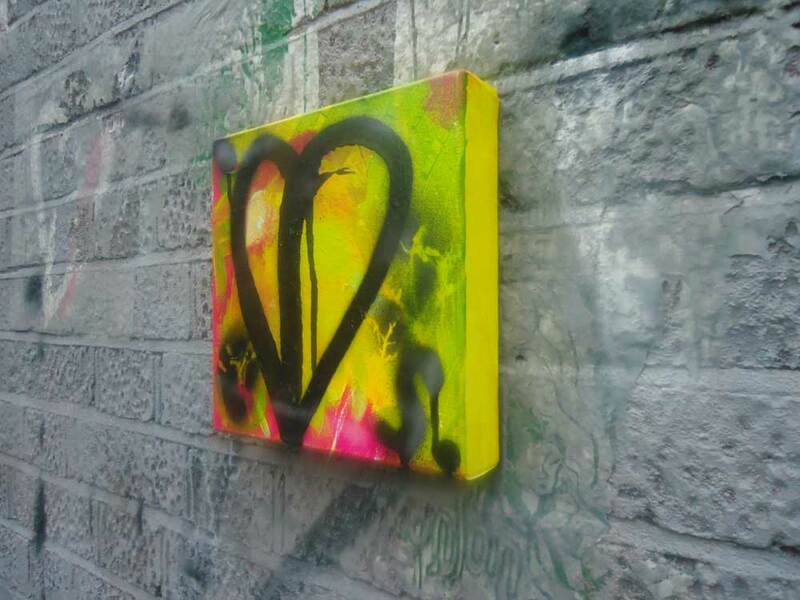 For one last time in Vyner Street, Sean Worrall and a number of guests will show a selection of work, all work will be on sale, none of the pieces will be priced. Viewers can name their own price on any of the pieces, there will be no debate, whatever the viewer offers for a piece of work will be the price accepted and the viewer/buyer can take away the piece for the price they wish to pay. There will be no discussion, no debate, I shall be delighted to see you leaving with a piece of art exchanged for whatever you think is fair or or indeed for a price that that you think you can afford. Original art for everyone who would like a piece. If you think it too intimidating then please please don’t be, this is a relaxed event, we are happy for you to leave with a piece, and do remember, I have left hundreds of pieces of art out for free this year around places like the Hackney WickED art festival, the Folkestone Fringe, around the streets and canal banks of London, the Liverpool Biennial and beyond, I am happy for you to pay a little (or as much) as you like. If you don’t want to name a price in the gallery with one of us standing there then fine, we can understand that, instead put your payment in an envelope before hand (or in one of the envelopes provided and we shall take your envelope and not look in the envelope until you have left with your piece of art. Come buy a piece of art for as little as £1 (or less) or as much as £1000 (or more), or just come have a look anyway, we run an art gallery, not a shop!. The only rule is no more than one piece per person. If you wish to buy a second piece then we will reserve the right to say no. A percentage of the money made will go towards the evolution of Cultivate, a percentage to St Joseph’s Hospice, you find St Joseph’s around the corner from us in Vyner Street and we believe those who run art spaces, galleries should join in with the community, not take over the community, and yes a percentage will go to the artists (I need to buy fresh paint and maybe some food, paint doesn’t taste nice). Previous More growth, found it on Emma Street, taking it to a car park in London, W1, we could not agree…. Next WHAT PRICE ART? Day one, some words and show photos…..
CHINESE OPEN 2014 – Chinatown, Soho. 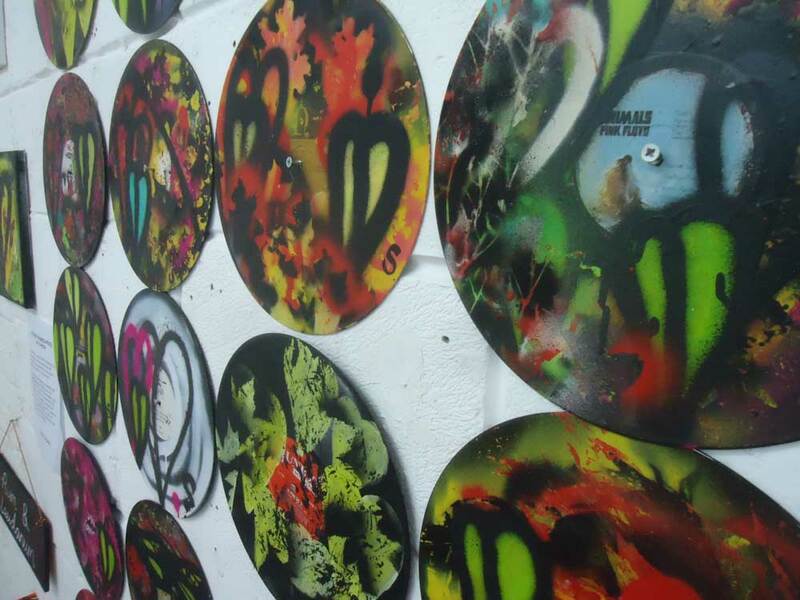 RECORD COVERS, ZINES and such….